When I started going to the Gym every night, Flyfour thought that he should start getting some exercise too. So with the vouchers I won at The MAD Blog Awards last year for A Mothers Ramblings we brought him a bike from Evans and he has been out cycling every evening. After his first session on his bike (cycling home from the Cycle Shop) he decided that what he really needed was an app that would keep track of his route, would let him know what direction he had to go and would generally keep records for him. I suggested an app that he discovered that he loved, but the problem was he had nowhere to store his phone whilst he was out that felt safe and so he started looking at different phone holders that he could mount on the bike handle bars. There were a couple that he liked and we were looking at buying as an early Anniversary gift for him, when Rutland Cycling asked if we'd like to try out the I Phone/Smart Phone Holder that they sell. When it arrived, Daddy put it on his bike straight away and set off on his first Cycle ride with it. When he got home he said that he wasn't sure about the holder because at times he felt that it was a bit loose and that his phone might work its way free. He agreed though that he would use it a few more times to see if it was just his own nervousness that made it feel like it wasn't secure enough or if it was something he didn't like about the holder. 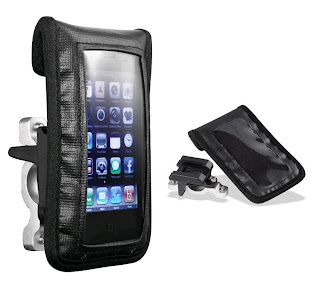 Flyfour has used the holder every few rides and has found that it is secure enough to hold the phone (even when he is cycling rather fast downhill) even though it does seem a little wobbly at times. Flyfour does have a few issues with the holder. His iphone has a screen protector on and also has a case. It only just fits into the phone holder and sometimes the plastic part of the holder sticks to the Screen protector and it seems to pull the protector off the screen. The other issue is that Flyfour hasn't been able to find a bluetooth headset suitable for listening to what his app shouts at him whilst he's out cycling and this holder isn't suitable for use with headphones (well one ear bud!) as the flap is in the way of the headphone socket. Overall though it's a good holder, it keeps the phone in a visible place so that you can follow maps, or check your timings or even make sure that you aren't missing an important phone call. Flyfour has suggested that I use it when I go out on my bike this weekend, so I'll report back after I've been out. We were sent the Rutland iphone/smart phone holder to review.